Elmo John Allen Ray was born in Federal Point, Florida, on March 3, 1911. He was raised in Hastings, Florida, where John Allen Ray, Elmo’s father, worked as a farmer to provide for the family. Mrs. Lillie Ray, Elmo’s mother, looked after the children and took care of the family’s needs at home. Elmo was from a large family, he was one of eight children who lived in a 3-bedroom house in a small farming community. As was the case for many young men in his community, once he reached the age where he could help his father on the farm he dropped out of school and went to work. To earn some extra money, Ray started fighting in battle royals at night after working on the farm. His first encounter with these types of fights took place in Tampa, Florida. Elmer, as he preferred to be called, would get in the ring with nine other black fighters who all had one hand tied behind their backs, no blindfolds, and fight it out with the last man standing receiving the prize of $9. He was said to have won 61 of these contests and never lost. When starting out in the pro ranks he would go by the name of Kid Ray and would often be matched with more experienced fighters than himself. The pay was not great, so he took on another job wrestling alligators at a place called the Indian Village for $12 a week. 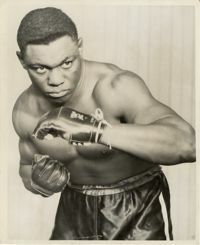 After meeting mostly local fighters for the first few years of his career he then took on the iron-chinned Obie Walker. The two met a total of twelve times in their careers with Ray winning five times, Walker winning four times, two draws, and one no contest. In between his fights with Walker, he would lose to future heavyweight champion Jersey Joe Walcott (3rd round KO) and to the current light-heavyweight champion John Henry Lewis in a fight that he put up an impressive effort until being stopped in the 12th round. Ray did well but he was missing guidance. Ray’s first manager and trainer was Walter E. Harris, the principal at Hastings Vocational High School. Harris knew nothing about boxing and Ray’s career wasn’t going very far with him. It wasn’t until 1943 that Ray met up with Tommy O’Loughlin, a man who would become his manager for the rest of his career. O’Loughlin got Ray the bigger paydays and the proper training that he did not have before. His first fight under his new manager was against the nationally ranked Turkey Thompson, a fight that Elmer would later say was one of the two hardest fights of his career. The bout was declared a no contest after Ray was struck low and could not continue, he was ahead at the time of the stoppage. The two met in a rematch that ended with Thompson knocking Ray out in the first round. Ray would then go on a 50-fight winning streak which included a win over Jersey Joe Walcott before losing a majority decision to Jersey Joe Walcott in their third meeting in March of 1947. Ray would go on to gain a win and a loss over future heavyweight champion Ezzard Charles. During his career he would rank as high as number two in the world but would never fight for the heavyweight title. He did face heavyweight champion Joe Louis three times in exhibitions but was knocked out in their last meeting. After retiring from the ring in 1949, Ray picked up several jobs to support his family (a wife and five children), but he would go on to work with Honeywell Airport in California where he would retire. Ray lived out the rest of his days in Inglewood, California until his death on May 20, 1987 at the age of 76.